Just a quick update from the Hoo-rag team! 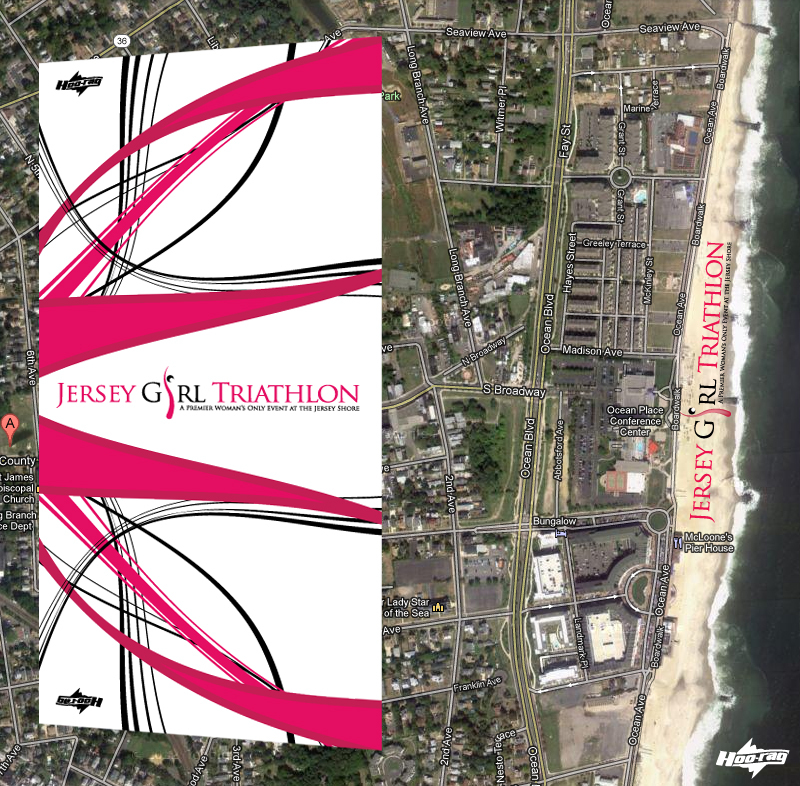 We are proud and excited to announce that Hoo-rags are headed to Long Branch, New Jersey for this years epic Jersey Girl triathalon. We are in production on these custom Hoo-rags for this event as well as the Sandy Hookers running club. The first group is at 6:50 AM. Swim is straight out and back along a line of buoys. You will go around the buoys, keeping them on your left at all times to the end, make a u-turn and then straight in to the finish on the other side of the line of buoys. Course will be lined with more than 20 lifeguards. In addition, swim angels will be available on shore and in the water (wearing yellow caps) if you need assistance for the swim. You can rest on a surfboard, rope or use a noodle at any time during the swim. There will be swim corals on the beach, please line up according to your wave start. We will be exiting the transition area on our bikes heading north along the boardwalk. Please stay to the right and proceed with caution. At the end of the boardwalk, the pavement is rough, take that turn very slowly. Left turn, along the fence at 7 Presidents then make first right turn. Do NOT go straight out onto Ocean Blvd. Also, be cautious of people entering Seven Presidents Park. Remember – ROADS ARE NOT CLOSED TO TRAFFIC! Be cautious at all intersections, we have over 30 police officers on the course. They are to assist in safety, you are responsible for watching out unsafe drivers or pedestrians People can cross the course and cut you off at any race. In addition, there are 40 volunteers staffing all turns, indicating direction, etc. Bike Loop: You will ride only one loop of the course and turn right onto Seaview from Ocean Boulevard and then continue straight to the ocean, turn right and follow towards transition area. REMEMBER: It is always the responsibility as an athlete to be familiar with the course. 3 Mile Run: Athletes will turn left (east) upon exiting transition area, then turn right (south) towards the south end of the boardwalk on the paved path following signs and volunteer direction. Water stop at mile 1 (mile 2 on return) is NOT the turn around. Continue on following signs and volunteer direction to turn around at very south end of boardwalk, past bathrooms and snack bar. Please stay to the right. We want to wish and the women competing in this event the best of luck and look forward to see you all Rocking the Rag! Previous post: Jason Arnold Rocking the Rag!